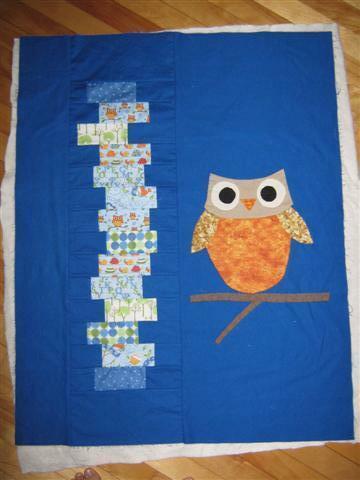 I've finished appliqueing the owl to my Hoot Hoot quilt. I'm currently searching for my big needles to embroider "ear hair" and claws. I'm getting a bit impatient to get going, so if I don't find them soon, I'll go and buy new needles. Question for you: I also can't find my stash of embroidery yarn, do you think wool will do the trick or should I just go and buy some thicker yarn (embroidery or darning or whatever)? i don't do much embroidery or anything like that so i am afraid i will not be much help on this...but i do love the quilt top. the whole thing is amazing. I imagine you are hunkering down for Earl..what a date he turned out to be....be safe...here in Ontario, we will get rain of course, but diminished winds. Thinking of you. What a very cute applique!